I thought it was breathtaking! 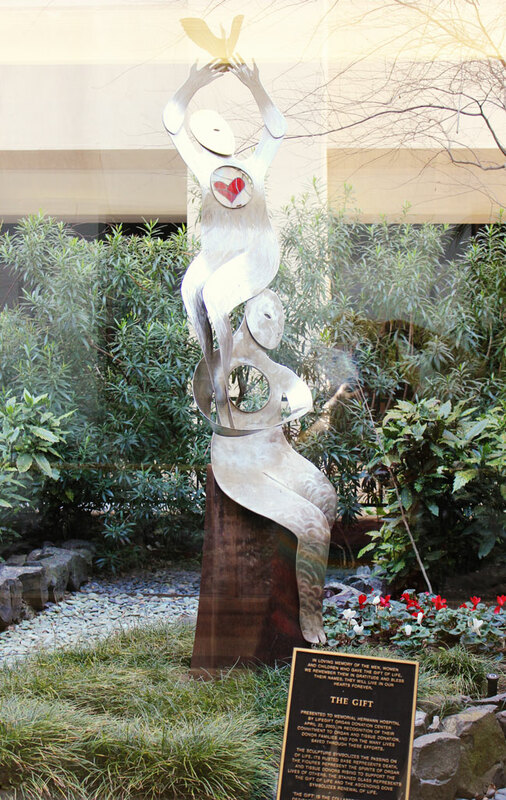 It is a tribute to all of the organ donors in the world. But, as I looked at it, all I could think about is the LOVE that is shared with family and friends as they lift you up in life through the good times and bad. Our family is about to be given a special GIFT very, very soon! I am told it could be as early as next week!!! My oldest daughter thought it prudent, to have her husband and myself take a practice run to the hospital before the baby comes. See this hospital is a good 45 minutes away from home, once you get there, you are parking about 2 miles from where the maternity floor is….say it isn’t so!!!! sigh. So different, than in my day…smile. I don’t know HOW I am going to remember all the directions to finally find her, when the time comes. On top of it, I will have Little Man with me, bringing him up to meet his Little Sis! Can you just imagine if I get lost in this huge maze of skywalks, parking garages, corridors etc. with him? He will have no patience for any of Grammies forgetfulness! Smile. 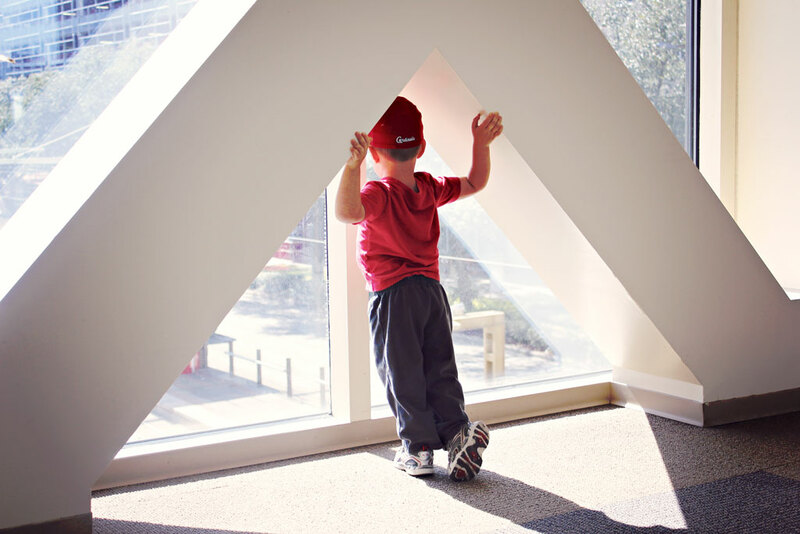 Here you see Little Man looking out over the skywalk, while he is listening to Mommy and Daddy talk about the directions, once we arrive at the hospital. My daughter is giving her husband the overview of the parking situation, while we are on top of one of the skywalks. She was telling him so many directions, turn left there, then right, two more rights, then a left….do a turn around…etc. Oh MY WORD!!!! Can you see how BIG “Little Sis” is getting to be? Isn’t it wonderful? 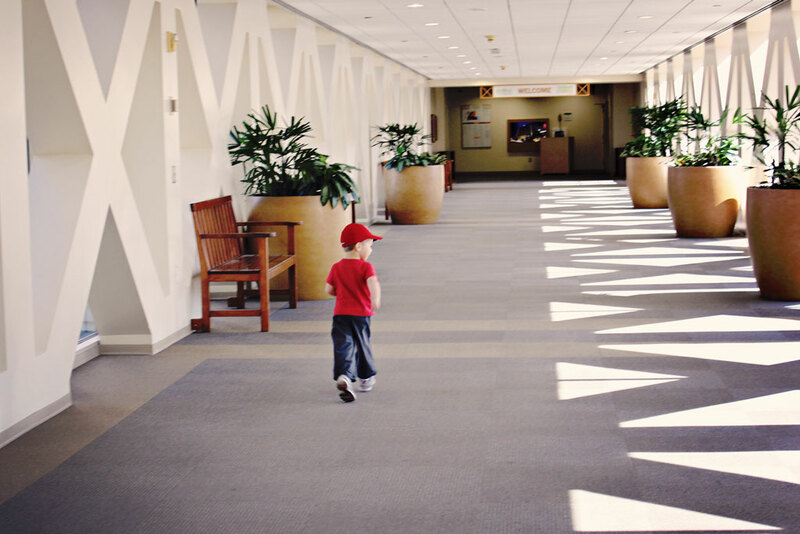 Exciting news, and wonderful photography of the hospital and your beautiful family…especially cute of your little man! I love that photo of Little Man looking out the window with his foot kicked back a bit. And that sculpture is gorgeous! Best wishes and healthy arrival to the latest addition to the family! So cute…how did we ever survive without GPS? Best wishes to you all . That’s quite the bump! This day was an example of another gift that you have stored. You have so many more to enjoy. Nice time and great expectations. Good Luck to all of you. Enjoy your time with the Little Man as much as you can. In few years it is going to be absolutely different relation. He will be busy with his friends, games and other stuff. All the best to all your Family. Love the sculpture. A family friend’s two year old was recently the recipient of the gift of a heart. So many emotions around that process… Amazing folks who can so generously offer the gift of life to another while suffering such great loss of their own. What an exciting time for ALL of you! Standing by to hear details of another blessed event! And little Man is growing strong and tall, too. that is so darn sweet. Best of Lucky to your families new little edition. so exciting. Congrats, such an exciting time for you and your family. I am sure you will do fine with all the directions. Beautiful sculpture, my dad is alive today, because someone gave him a “gift” over 20 years ago. We are so thankful. I love the picture of Little Man running showing you the way! You must be counting the minutes! Such an exciting time, enjoy every minute! Seems someone is going to make an awesome big brother! The picture of the Little Man under the beams shows how much he has grown up now. Such a fun and exciting time for you! Did you ever get to see the other new grandbaby? No, unfortunately my ear is still plugged and can’t get on an airplane. I have an ENT appt in the beginning of March. Your daughter looks as if she is ready! What a beautiful piece of art! It was probably a good idea for a trial run to the hospital. The Houston Center is quite a complex with some underground parking and connections to buildings. My grandson was born at St. Luke’s 23 years ago but it has expanded even more. She and the baby will have access to the best there. Good luck! New life always brings a gift to everyone.